The 77mm PURE Harmonie Circular Polarizer Filter from Cokin helps to reduce reflections and glare by filtering out light that has become polarized due to reflection from a non-metallic surface. The light from the sun naturally becomes partially polarized due to reflecting off electrons in air molecules, causing the light to scatter into what appears as haze. A polarizing filter arranges, and filters, this directionally polarized light perpendicularly to the reflected light, allowing for the absorption of much of this light. This results in a noticeable reduction of glare and reflections from non-metallic surfaces and an increase in the saturation of skies and foliage. When the 77mm PURE Harmonie Circular Polarizer Filter is applied, 77% of ultraviolet light waves are blocked at 400 nanometers, before which they are progressively eliminated, helping to limit the light that enters a camera to the visible spectrum. The appearance of blue casts that can occur while recording video or still photos under daylight that also features ultraviolet light is reduced, preserving color accuracy throughout the frame. Cokin PURE Harmonie circular polarizer filters are constructed from Schott glass for increased optical clarity as well as color fidelity, and promote nearly flat attenuation of visible and UV light. 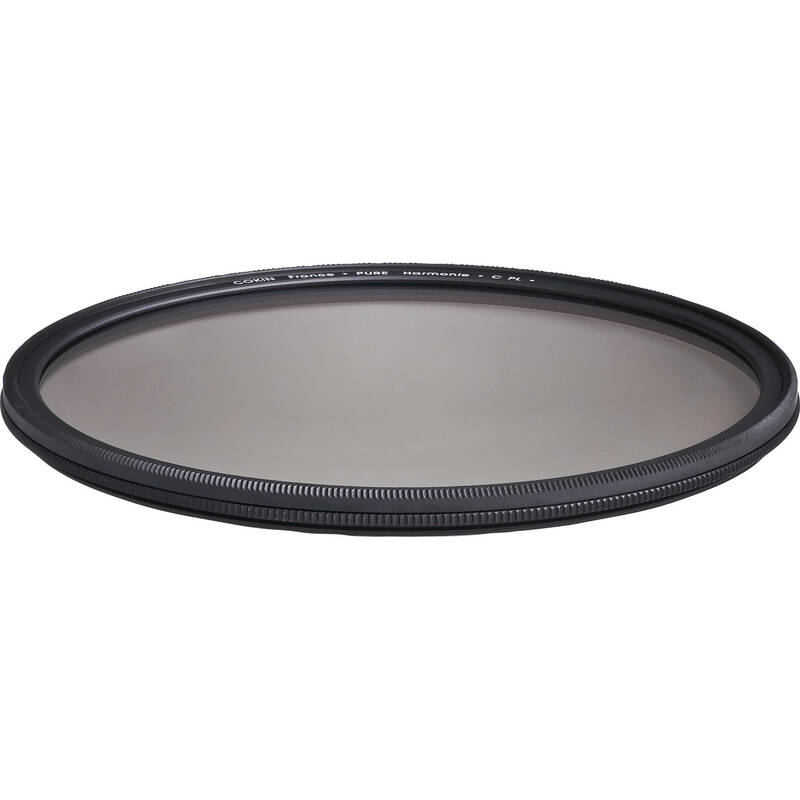 This 77mm PURE Harmonie circular polarizer filter features a durable, lightweight, 4.75mm-thick aluminum-alloy filter ring assembly with a front ring that can be rotated to adjust the intensity of the polarization effect. These rings minimize the potential for vignetting, and the front ring also includes corresponding 77mm front filter threads for use with other screw-on filters. To help eliminate internal ghosting and reflections, each glass surface of the 77mm PURE Harmonie Circular Polarizer Filter features 16 layers of Cokin's EVERCLEAR 5 anti-reflection coating. These coatings are resistant to oil, dust, dirt, and scratches, offering greater protection to the filter and help it to stay clean for longer than with uncoated filters. The coatings are also hydrophobic, resulting in an improved beading effect when in contact with water for greater cleaning efficiency. 16-layer Cokin EVERCLEAR 5 multi-coating prevents internal ghosting and reflections, is oil, dust, dirt, as well as scratch-resistant, and provides an improved beading effect with water for more efficient cleaning. Approximately 45% average light transmission. 2x filter factor reduces exposure by 1 stop. Slim, 4.75mm-thick, aluminum-alloy filter ring assembly helps to prevent vignetting, while remaining lightweight. Side knurling to provide a more textured grip when mounting or removing from a lens, as well as when rotating the front filter ring to adjust the intensity of the polarization effect. 77mm front filter threads allow for use with other filters. 77mm PURE Harmonie Circular Polarizer Filter is rated 2.8 out of 5 by 4. Rated 4 out of 5 by Le Vince from Thinest polarizer I've owned! I can't comment on glass/filter quality so much as I have not had a chance to compare hands-on with more expensive filters. That being said, it is my first low-profile polarizer and it is so thin I was able to use it on my Canon 17-40 mm lens along with the never-leave-the-lens UV filter (also low profile), on a full frame body, and only had a very slight vignetting effect in the corners, easily corrected in Lightroom. Attached sample image was shot at 17mm, with a Hoya low profile UV filter and this polarizing filter, usual Lightroom lens corrections but no specific vignetting corrections, nor straightening of the image so you see the full shot. Not bad for two stacked filters! Rated 5 out of 5 by zozocam from Really thin design, works well This is the world's thinnest polarizer, that is very important when using ultra-wide angle lens. This filter does the job without vignetting even at 11mm. Rated 1 out of 5 by Caesar from Massive distortion / poor design I have been using Pro1 slim circular polarizers from Hoya/Kenko for years. They're great but I found the rear, multi-coated surface to scratch easily and hard to clean so when I heard about the PURE Harmonie series of Circular Polarizers from COKIN I decided to give them a try. I bought two, one in 77mm, the other in 82mm. Big mistake. Both greatly distort the image, the 77mm is so bad my lens won't focus half the time. In fact, you can see the distortion through the view finder and in a simple newspaper test (look at the text through the polarizer than move it arround as your eye stays focused in the same spot, you'll see the text weave and wobble). The 82 is only marginally better. Furthermore, in an effort to make these filters as thin as possible, their thread is extremely shallow, these filters are very hard to mount on the lens and I've had them just pop out while hiking with the filter on my lens. Do yourself a favor and buy another brand. Rated 1 out of 5 by Barry from Not so good I returned this filter. It would not let my lenses focus. Using pro lenses on Nikon D4. Will this filter cause vignetting if used on a Canon EF 10-22mm f/3.5-4.5 USM (@10mm) on top of a standard thickness UV filter? Because one of the filters you are using is a standard thickness, the possibility does exist that there may be vignette, but it should not be a major concern, as the Cokin 77mm PURE Harmonie Circular Polarizer is designed for wide angle lenses. Will this filter work without vignetting on a Canon 17-40mm f/4 (used at 17mm) ? The Cokin 77mm PURE Harmonie Circular Polarizer Filter is an ultra thin filter that is designed to reduce vignetting. While it has not been specifically tested with the Canon 17-40mm lens, as the Cokin 77mm PURE Harmonie Circular Polarizer Filter is the thinnest circular polarizer filter on the market (and I have used other thin polarizer filters on this lens), this filter should have the least amount of vignetting of any other filter currently available, if any is perceptible at all. As such, this would be your best option if vignetting is a concern.